Caprese burgers are topped with the classic flavors of caprese — tomato, basil, mozzarella, and a balsamic reduction sauce. Welcome to the #SundaySupper Hamburgers and Hotdogs event, hosted by Christie of A Kitchen Hoor’s Adventures! We’re sharing, what else, hot dog and hamburger recipes! Since I’m not a hot dog fan, I chose to share a burger recipe. Since it’s summer time, I chose one of my favorite summer burgers, the Caprese burger. I love caprese ANYTHING, so if it combines tomato, basil and mozzarella, I’ll probably eat it. The burger itself is pretty simple, just ground beef seasoned on the outside with kosher salt. This helps it get a nice sear on the outside. 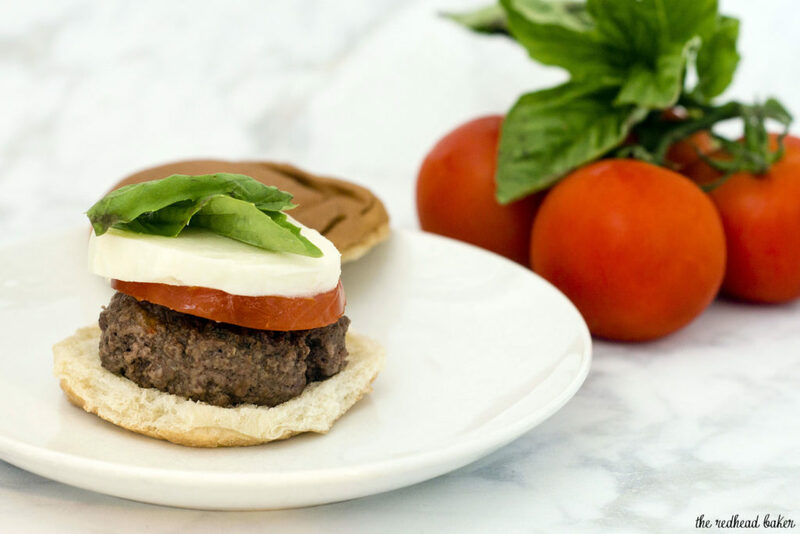 The burger is topped with thick slices of mozzarella and fresh tomato, as well as basil. 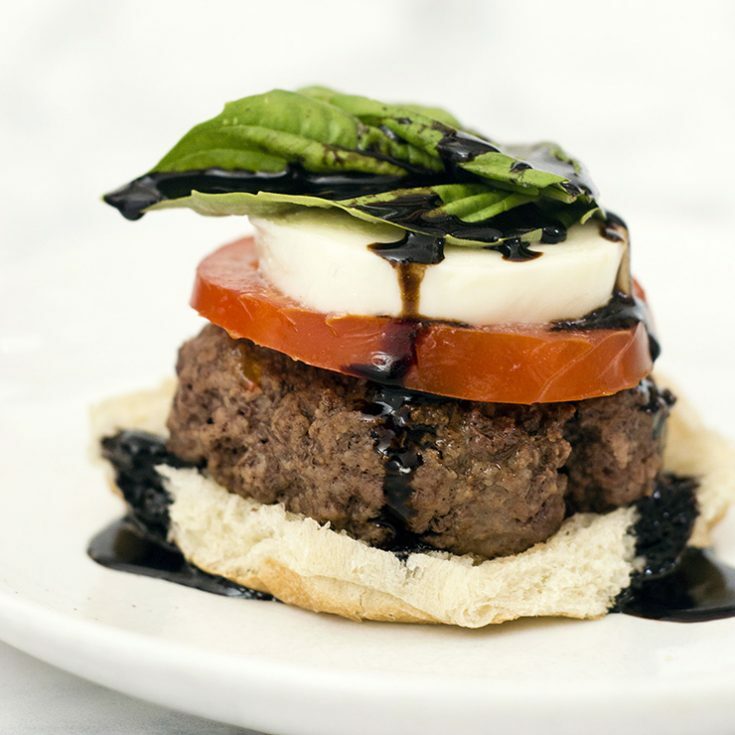 Then, the burger is drizzled with an easy-to-make balsamic reduction. It’s so simple yet so flavorful, and so very SUMMER. 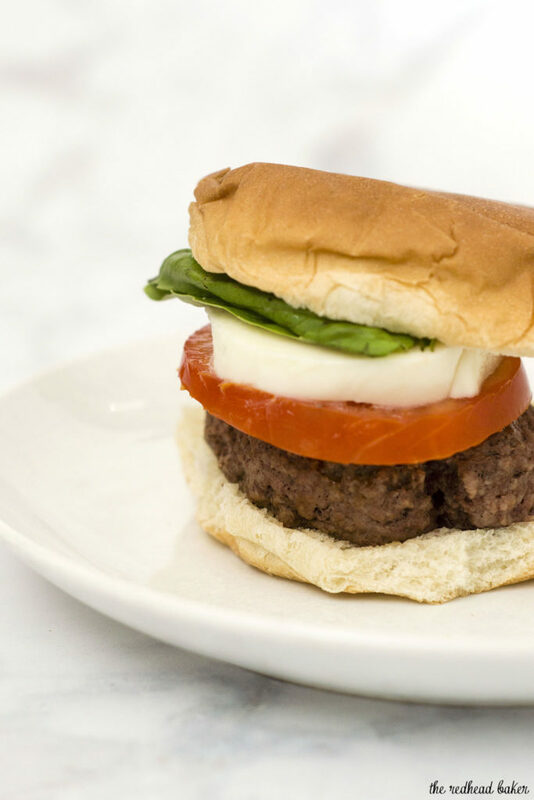 Pin this Caprese Burgers recipe for later! Make the sauce: Place the balsamic vinegar in a small saucepan and bring to a boil. Reduce the heat and simmer until reduced to 1/4 cup (10 to 15 minutes). Keep a close eye on it. Turn off the heat, and add the butter, stir until melted and incorporated. Season to taste with salt and pepper. Set aside to cool. Divide the meat into 4-oz portions and shape into patties. Heat a stainless steel or cast-iron skillet over medium-high heat. Sprinkle both sides of each patty with kosher salt. Cook the burgers about 4 minutes on each side for medium-rare doneness (longer if you prefer medium-well or well-done). While the burgers are cooking, split the burger buns and place them on a broiler pan, cut-side up. Toast under the broiler for 30 seconds to a minute. Place a burger patty on each bottom bun half. Top with tomato, mozarella cheese and 2 basil leaves. 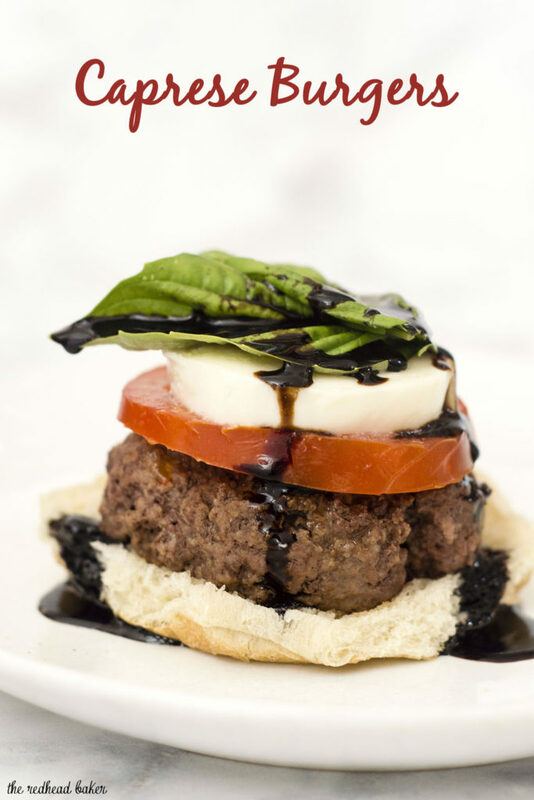 Drizzle on balsamic sauce, then top with the other half of the bun and serve. Discover more #SundaySupper Hamburgers and Hotdogs! There’s almost nothing better than a caprese in the summer – as long as you’ve got that balsamic! Love that you added it to a burger. You have all the good stuff in here. I love caprese with fresh basil and garden ripe tomatoes! These burgers look delish, Coleen. Love the balsamic glaze. of. I say to you, I certainly get annoyed whilst folks think about worries that they plainly do not recognize about.